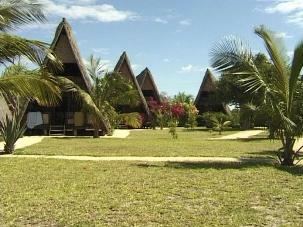 Aguia Negra with its tall A-frame chalets is situated adjacent to Vilanculos Beach Lodge, close to the beach, with a spectacular view of the bay and islands. The lodge is small, comfortable and affordable and is another springboard to the romantic islands of the Bazaruto Archipelago. Diving, snorkeling, sailing, fishing and other watersport activities can be arranged through the resort. The restaurant serves all meals, with an a-la-cart or set menu. The upstairs bar has a large deck overlooking the resort and ocean and is the ideal place to enjoy that sundowner or to watch your favorite sport via satellite TV. There are 12 chalets sleeping 6 persons each. 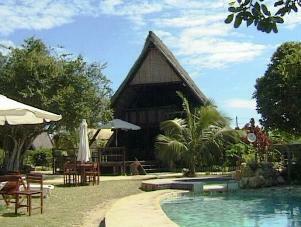 All chalets are en­ suite with hot and cold water with flush toilets.